BRIGHTON, Mich.- It's every parent's worst nightmare. Did you know that over 2,000 children are reported missing every single day in the United States? We become comfortable with our safety, but you can never be too prepared. 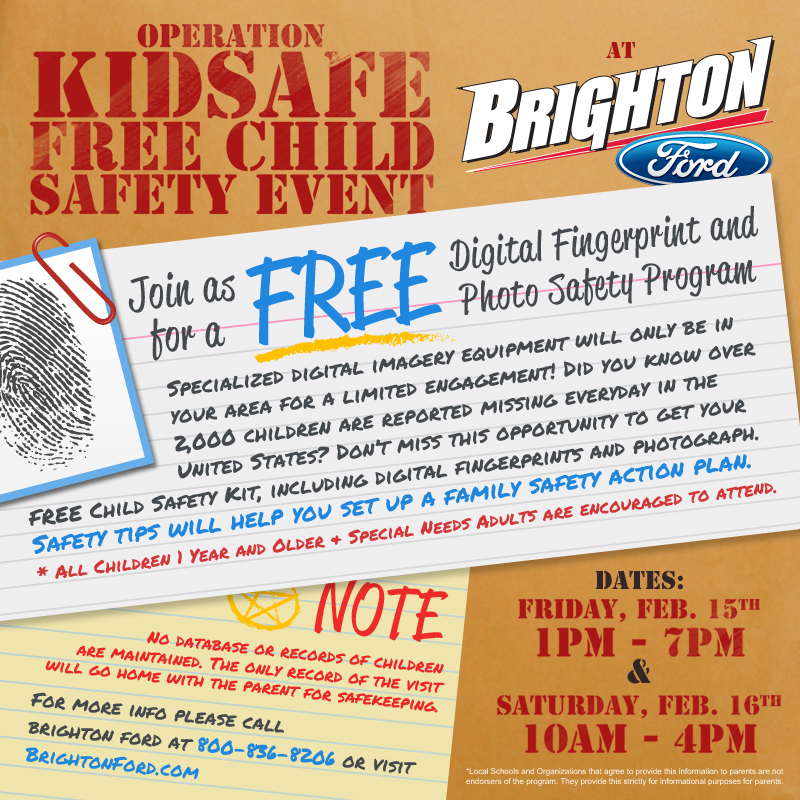 That's why you need to mark your calendar right now for Brighton Ford's Operation KidSafe, Free Child Safety Event this month! This important and informative event will take place on both Friday, February 15th and Saturday, February 16th. Operation KidSafe, our Free Child Safety Event, will run from 1pm-7pm on February 15th and from 10am-4pm on February 16th. At Operation KidSafe you'll receive a free child safety kit which includes free digital fingerprints and photograph. The safety kit also provides information and tips to help you set up a family safety action plan. However, the specialized digital imagery equipment will only be in our area on these two days, so do not miss this event! All children 1-year and older, as well as all special needs adults are encouraged to attend! Join your Livingston County Ford Dealer in our effort to keep our children safe at our Free Child Safety Event, Operation KidSafe! Should you have a need, we'd also love to help you find the perfect vehicle for your family, and we can help you save with our Ford Explorer Rebates or Ford Flex Rebates! Brighton Ford is located at 8240 Grand River Ave. just north of I-96 in Brighton. We are a family owned and operated business that strives on customer satisfaction. For more information on Brighton Ford visit BrightonFord.com or give us a call at (800)-836-8206.